Get tickets to Opening Reception: Heroes of the Knish! Opening Reception: Heroes of the Knish! Event starts at 2 PM, with curator's talk and Knish Trivia at 3! Heroes of the Knish: Making a Living and Making a Life tells the story of courageous women and men who churned out potato pies and paved lives for themselves and their families. The exhibit is curated by Laura Silver, award-winning author of Knish: In Search of the Jewish Soul Food (Brandeis, 2014). At the opening reception on Sunday, February 12, Silver, known as the world’s leading expert on the knish, will deliver an illustrated talk on the sultry side of the potato pie. Aphrodisiac, inspiration for off-color jokes and fount of feminism, the knish has been a hot commodity in New York City for over a decade. Attendees can cut their teeth on knish trivia while noshing on this classic street food from Knishery NYC and Gabila’s Knishes! Since its arrival on these shores with Jewish immigrants from Eastern Europe in the early 20th century, the knish — whose origins can be traced to rural Poland of the 1600s — has wedged itself into the hearts, guts and psyches of New Yorkers of all stripes. From the Lower East Side of Manhattan to the Brooklyn seaside, the knish has become a standby on sidewalk carts and at ethnic eateries in the five boroughs and beyond! 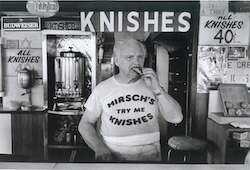 The exhibit introduces legendary and lesser-known knish kings and queens who have made their mark on New York City over the last century. It showcases a never-before-assembled collection of artifacts, archival materials, and stories from knish purveyors past and present. Items on display include a stock certificate from Mrs. Stahl’s Knishes of Brighton Beach, the knish correspondence of First Lady Eleanor Roosevelt; a song about Ruby the Knishman, who sold potato pies to schoolkids in Canarsie; and chronicles of the Knish Crisis of 2013, when, following a factory fire, Gabila’s was forced to stop production of square, Coney Island-style knishes for nearly six months.